An extremely fine bible, illuminated by artists working for the royal court in Paris, likely made c. 1260-1270. In Paris, the patronage of Blanche of Castile (d. 1252) and her son Louis IX (d. 1270, canonized saint in 1297) brought a golden age of innovation, with the Sainte Chapelle and the finest codices (such as this) as radiant highlights. 343 x 245 mm. – 457 leaves, with 83 large painted and 79 historiated initials. Attributed to the Parisian Royal Psalter workshop. One of the most abiding inventions of the 13th century was the one-volume Latin Bible. The books of the Old and New Testaments in the Latin translation composed by St Jerome (c. 342-420), were the most fundamental texts of the European Middle Ages. These had usually been copied either as separate codices or in large sets of multiple volumes. To arrange all Bible texts in its entirety into a single portable volume and in a standard order, evolved in late 12th-century France. 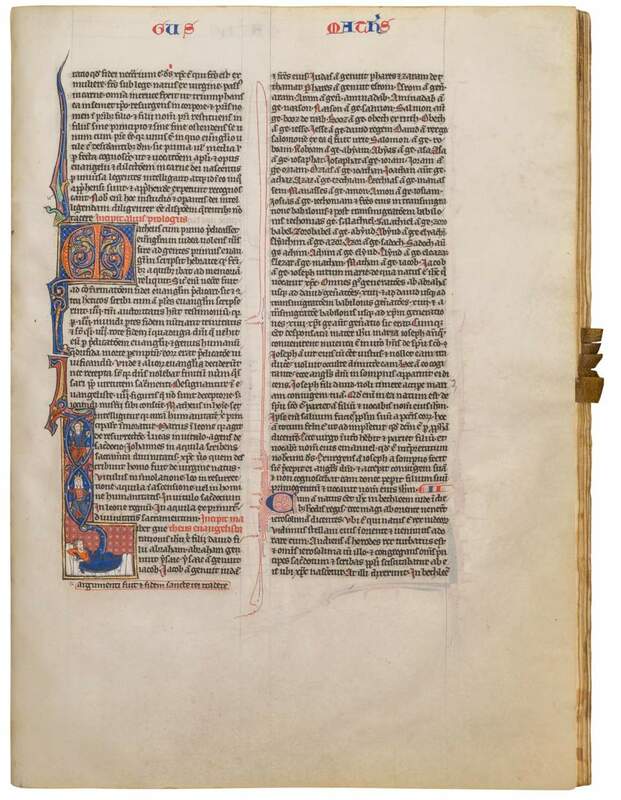 This new kind of Bible matured in Paris in the first half of the 13th century. Since then, most Bibles were written in tiny script over double columns to a page, while following that Parisian order of the texts, with numbering of the chapters, with running-titles, and a dictionary of names at the end. As most 13th-century Parisian Bibles were small, to fit into the handbags of travelling friars and professors, luxury and larger versions as the present volume were made on commission. The large book at hand was made for astonishing display, presumably on a lectern, either for private use or in a community. The precious and sumptuous decoration in this large Bible reflects great coherence. The painting throughout the manuscript conveys harmony and movement. The painted infills of the decorated letters and their extensions consist of delicate interlacing foliage, or of the tails and necks of animals. The historiated initials include magnificent, elegant figures, often in architectural settings. Be it dragons, grotesques, or humans, all figures are slender, graceful, and of noble, elegant posture. Overall, the compositions are highly expressive and betray the finest artistic and technical ingenuity. The manuscript’s original patron is unknown, but the frequent occurrence of small fleurs-de-lys that top staffs and sceptres may be a clue. With so many refined illuminations, the volume at hand is an important artistic document. The biblical narratives of this period – the heyday of didactic text production – most certainly were appreciated and understood by its noble commissioners. Some of the iconography presented in the manuscript is rather unusual, for instance, in the subjects chosen to illustrate the Epistles of Paul or in the royal symbolism added to several images (read more in our blog). The opening leaf received new border decoration in the 15th century. It shows that the book was still in France at that time, clearly appreciated for its texts and extremely fine illumination. Read more about this manuscript in our blog post.